Thiol reactive crosslinkers are one of the most common classes of crosslinkers in bioconjugation (1). Because most proteins contain far more free amines than thiols and disulfides, conjugation to a thiol allows for greater control of the conjugation. Even more control of the conjugation process is afforded if a thiol reactive compound is combined with an amine reactive compound to create a heterobifunctional crosslinker. Thiol reactive crosslinkers from Quanta BioDesign, Ltd.
Quanta BioDesign offers a variety of homo- and heterobifunctional thiol reactive crosslinkers for bioconjugation with dPEG® spacers of several different lengths. Among those we offer are maleimide crosslinkers. Near neutral pH, the double bond of the maleimide reacts preferentially and very rapidly with a thiol to form a thioether bond that is not susceptible to reduction (2). Quanta BioDesign offers homobifunctional bis-maleimides as well as a few heterobifunctional maleimide bioconjugation crosslinkers with the other end being an amine reactive active ester. One of our most popular products is Mal-dPEG®4-NHS ester, product number 10214 (shown in Figure 1). It contains a 22 atom (24.8 Å) tetraethylene glycol spacer functionalized on one end with a thiol reactive maleimidopropyl group and on the other end with an amine reactive propionic acid-N-hydroxysuccinimide (NHS) ester. Figure 1: Thiol reactive crosslinker PN10214, one of Quanta BioDesign’s most popular PEGylation reagents, has a thiol reactive maleimide group on one end and an amine reactive NHS ester on the other end of a tetraethylene glycol linker. Quanta BioDesign also offers this product with dPEG®2, dPEG®6, dPEG®8, dPEG®12, dPEG®24, and longer dPEG® linkers. You can view them all on our website. They are listed below in this post, or you can click here. August 2018 Update: MAL-dPEG® Crosslinkers are now available as TFP esters! Since first publishing this post, Quanta BioDesign, Ltd., expanded our line of maleimide-functionalized thiol reactive crosslinkers to include crosslinkers functionalized with 2,3,5,6-tetrafluorophenyl (TFP) esters. In-house research conducted by Quanta BioDesign shows that TFP esters are more stable to hydrolysis than NHS esters and react more readily with primary amines than NHS esters. If you want to see all of our MAL-dPEG®-TFP esters, please click here. As an example, PN10551, MAL-dPEG®4-TFP ester is shown in Figure 2, below. Also, Quanta BioDesign offers pyridyl disulfide (SPDP) bioconjugation crosslinkers (see also here). With these crosslinkers, a free thiol reacts with the SPDP moiety to produce a new disulfide bond, as illustrated in Reaction 1. 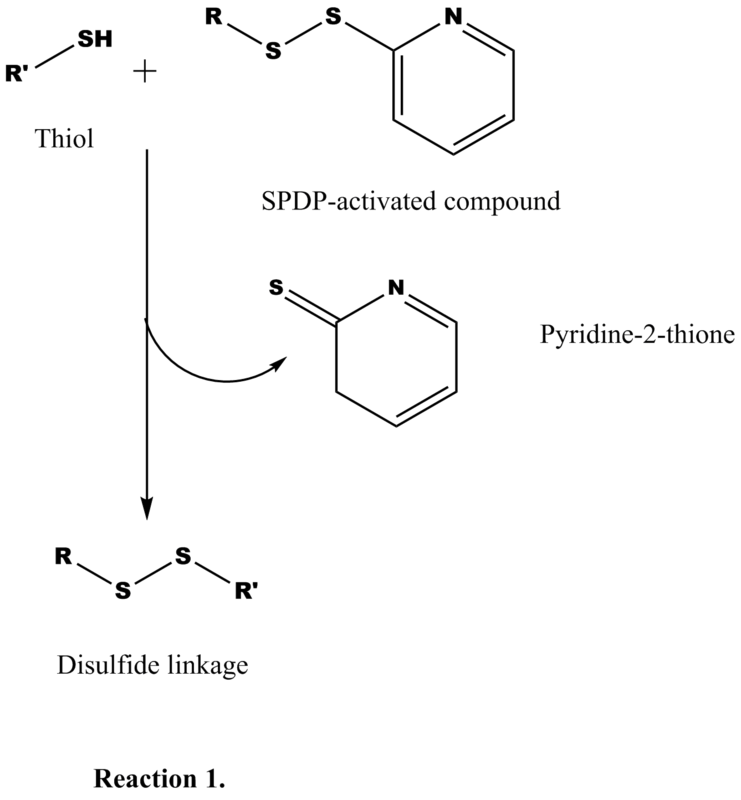 The reaction generates pyridine-2-thione, which cannot react with any remaining SPDP crosslinker because it does not contain a thiol (3, 4). Moreover, the newly-formed disulfide bond can be cleaved with a reducing agent or oxidized back to the disulfide bond. The SPDP line of crosslinkers provide a degree of flexibility not available with the maleimide crosslinkers. Both the maleimide and SPDP crosslinkers with dPEG® are available from Quanta BioDesign with a variety of PEG spacer lengths, ranging from four to twenty-four ethylene oxide units (and in some cases, even longer) Whatever the length and functionality you need for your thiol reactive crosslinking discrete PEGylation reagent, Quanta BioDesign can provide it for you. If you do not see what you want in our catalog, contact us about a custom synthesis. We can provide you with what you are looking for. 1. Hermanson, Greg T. Bioconjugate Techniques, 3rd Edition. Waltham, MA: Elsevier (Academic Press), copyright 2013, 1146 pages. Click here to return to the text. 2. Smyth, Derek G., Blumenfeld, O. O., and Konigsberg, W. Reactions of N-ethylmaleimide with peptides and amino acids. Biochem J. (1964), 91, 589-595. 3. Carlsson, J., Håkan, D., and Axén, R. Protein thiolation and reversible protein-protein conjugation. Biochem J. (1978), 173, 723-737. 4. Myers, D. A., Murdoch, W. J., and Villemez, C. L. Protein-peptide conjugation by a two-phase reaction, Biochem J. (1985), 227(1), 343. Additional Products from Quanta BioDesign, Ltd. Please call or email us and ask about our MAL-dPEG®x-TFP ester derivatives. If you want a longer length dPEG® spacer than you see here, please call or email us about that also. We will be glad to discuss them with you! Dan Dawson, M.S. received his BS in Chemistry from the University of Indianapolis in 2006, and his M.S. in Organic Chemistry from the University of Michigan in 2008. Dan is a Process Development Chemist involved in process development and scale-up activities. You can connect with Dan on LinkedIn at www.linkedin.com/pub/daniel-dawson/18/6a2/718.